Drive along the beautiful south side of the mountain range Aj-Petry. Visit at the fantastic church of Faros, that is situated at a height of 400 meters above sea level at the mountains. Visit at the beautiful palace and gardens of Count Vorontsov in Alupka. 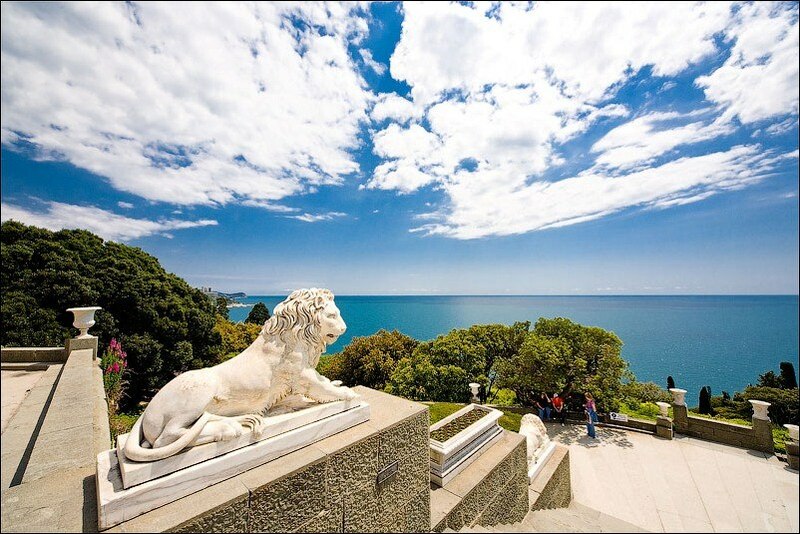 Earl Mikhail S. Vorontsov decided to build a palace on the southern Crimean coast. Initially a Crimean architect began to build the building, but a year later the Earl decided to give up his services. As a result of careful and meticulous research, he chose the English architect Edward Blore. By the time he was already known as one of the architects of Buckingham Palace. Also under his leadership carried out the construction of the Scottish castle of Sir Walter Scott. But the crowning architectural art of Blore became the Vorontsov Palace in Alupka. The majestic structure delicately inscribed in the green heart of the Crimean mountains. Alupka Palace complements the landscape. It was built of diabase, local stone, very capricious in operation, but heavy-duty - its superior quality granite. The monumental building is designed in the style of late English Gothic which the architect was organically connected with in a completely alien to her eastern architecture. The front of the west facade is a European medieval castle with all the attributes belonging to it, towers, battlements and impregnable walls. The North facade is an example of Tudor architecture which Blore harmoniously combined with the Gothic Revival architecture. The southern facade which is also be called the parade to appropriate to the palace by the sea, was built in the Moorish style. In the decorative frieze white niche sixfold sculpted inscription in Arabic: "And there is no victor but Allah." From the foot of the arch begins the famous castle park. Descend down the pompous staircase, along which three pairs of lions have settled down - sleeping, waking up and waking. They were all sculpted in the Italian studio Bonnani. And waking lions are an absolute copy of what the pope Clement XII established on the tomb in Rome. Walking down the stairs into the park one meets a succession of fountains and springs. Among them are chiseled copies of Bakhchisaray and "Cat's Eye", "Shell" and "Teahouse". The Palace park of Count Vorontsov today is divided by the Upper and Lower Miskhorsky highway, but it was laid simultaneously with the palace and created by German architect Carl Kebahom. On 40 hectares were planted more than 200 species of shrubs and trees imported from around the world. Along with them was brought to the native fertile soil for planting. exotic plants grown in the park today will never grow somewhere else in Crimea, but have become an integral part of the nature surroundings of the palace. They are a vivid example of human genius: only a true master could see foreign seedlings grown on the site through a hundred and fifty years.